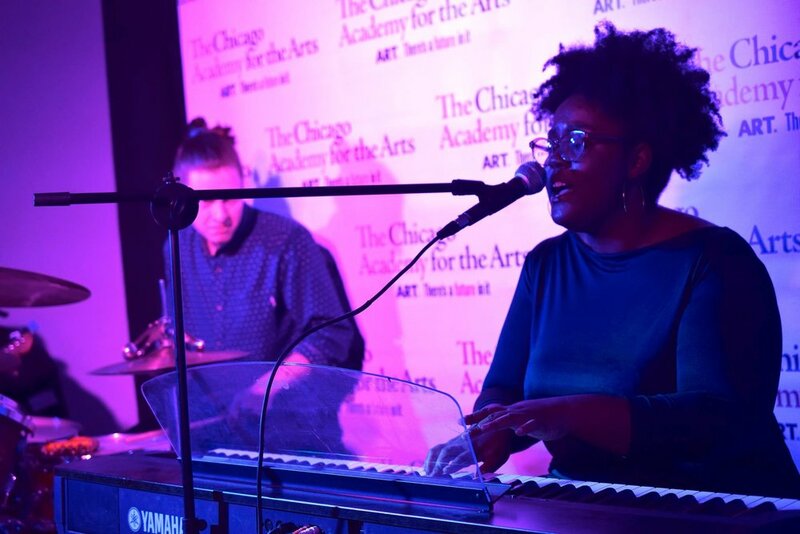 Akenya Seymour graduated from the Music Department of The Academy in 2010. Since then, she has completed a degree at New England Conservatory in Boston, released her own EP, and performed both live and in the studio with popular artists and musical legends. Read the full interview below to get to know Akenya’s story and her experience at The Academy. Before I started at New England Conservatory I made an EP, Overcome, with a bunch of fellow Academy students. After I graduated from college I moved back to Chicago and started to try to get myself established. At the top of 2016 I started performing a lot around the city. I met a lot of cool musicians -- a lot of cool rappers. Through those relationships I ended up performing at Lollapalooza with the rapper Smino, and then began working with the rapper Noname, who I’ve actually known since high school. She came out with an album that kind of went viral, and I ended up performing a lot with her. We opened for Lauryn Hill, did a two-week run in Europe, and even ended up performing a show in Israel. When we got back to the United States, I continued to musically direct her five-week American tour. That was the beginning of 2017. Since then, I’ve slowed down a bit, but I still managed to do a decent number of gigs this past summer, including performing my own music at North Coast Music Festival. Wow, that’s awesome. You’ve been busy. It doesn’t seem like you’ve had a break. Yeah, definitely. From the beginning of 2016 to fall of last year, I’ve really just been performing nonstop! So I think it’s OK if I just chill for a minute. Nothing is crazier than going on tour. Around that time I appeared on NPR’s Tiny Desk Concerts with Noname, and later got a call from the guy who used to book me at the California Clipper – turns out that guy was LeRoy Bach who used to be in Wilco. I guess he showed Jeff Tweedy the video, who asked me to come record on the new Mavis Staples album he was producing. At first I think they were going to use me on just a couple of tracks, but they liked me on the first day, and I ended up singing on the entire album. That came out this past November. Are you doing anything else of your own right now - recording or writing? Right now I’m really just focusing on making my own album, Moon in the 4th. The album is written, and I actually got a grant from The Academy to produce it, which is the next step. I’ve been working with another alumni, Luke Sangerman (Music ‘15) and a few other producers. It’s in the beginning stages, but I’m really excited, and the next few months should be really productive. I’m hoping to release it this year. I probably won’t be performing very much, but I might do a small college tour later in the year. It would be nice to have a record to tour on. What are your favorite memories of The Academy? What will you never forget? To be honest, I won’t forget anything from my time at The Academy- my first day there to my last. I got to perform at lot, way more than I did during college actually. That was a major complaint of mine about my experience at conservatory. It was a little bit more focused on practice, which is great, but I feel like it’s important to contextualize it through performance. At The Academy, there were so many jazz concerts and classical recitals. Towards the end of my high school career, the Department started doing Jazz Fest, which was 3 or 4 days of performing. That was really cool. And me and my classmates used to have jam sessions at Borders (when Borders still existed) on the weekends in Oak Park. Really fun. The Academy provided a lot of performance opportunities both inside and outside of school. That really led me to have the confidence to perform elsewhere, and look for opportunities in the city while I was still a teenager. So performance is what The Academy prepared you for the most? Absolutely. That was huge. I think sharing art and showcasing art is a huge priority at The Academy, which I appreciate. Also, a lot of the classes I took in the Music Department, including our final juries, were very similar to what a lot of colleges do. That really prepared me for conservatory. In fact, I might have been a little over prepared. I ended up testing out of a lot of things! Peers of mine who didn’t have that experience - who didn’t go to a performing arts high school - had to play catch up a little bit. Also, Rose Colella [Music Department Chair] and Alyssa Bennett [Classical Voice Faculty] came to the Music Department at the same time I started high school. It was cool for me to grow those four years with them, especially as I developed an interest in jazz; Rose was really instrumental in me choosing to go to college for jazz, in addition to teaching me skills like how to write a chart, how to direct a band, and how to be a good band leader. I learned a lot of that from her. Those were huge takeaways from The Academy that have helped me in the professional world. In your position as a growing musician, is there any advice that you would give students in the Music Department today? I want them to know that The Academy is really going to be there for them, and I want to encourage them to tap into the school as a resource. Jason Patera [Head of School] has really been a consistent influence in my life, even after graduation. If I ever need anything - an instrument, or equipment, a space to practice or rehearse, I can always count on him. So for the seniors who will be leaving the school shortly, don’t forget the people that you learned from. You can continue to learn from them, and they can continue to be there for you. And keep in touch with your peers. Those are going to be the people that will be working in your field. For example, I made a music video for my single, "Disappear", and everybody involved was an Academy graduate. That was so crazy. All the dancers were Academy dancers, the director was a Visual Arts Department student. You never know. It’s just great to be part of a larger creative family. I’ve been blessed to have that in many different ways in my life, but my experience at The Academy definitely stands out.